One of the keys to my eBay success is my consistency . Being consistent has proven to help me in my daily operations of the business. Here's what consistency means to me, as a senior venturing into a new business. Have a "pile" of like items to get ready to list/photograph/weigh & measure The order in which you do these is not as important as making sure you do the same thing daily. The reason for the "like items" is to make listing faster-create one listing and the rest are "sell similar" with just a few words , weights, photos changed. If you get tired, achy from sitting at your computer too long, need nourishment, etc., take a break and get away from your work. Most of us over 60, and even 50, have lots of issues with arthritis, circulation, etc. so we cannot sit for hours on end doing this work without breaks. Combine driving trips to stores, errands... Wednesday is my choice day for Goodwill Thrift Store senior discount days. And I do my grocery shopping on the way home, or drug store...whatever errands I have. Just be consistent and get it into your weekly routine. Whatever your dinner routine/bedtime routine is, keep it the same and work your business into that routine; but make it the same time frame every day so you get comfortable with the daily schedule. I start with emails and ship any items needing to go that day; then I look at my listings to see if any are stale-have been in my store a while with no activity/50 lookers with no watchers/bites and end those listing and do "sell similar" to make those listings fresh. I do my new listings in the evening (after I have gathered my pile for the day/photographed/weighed and measured...). I don't do a lot; just consistently every day, even if it is only one. And don't forget to add some time for Danni's webinars, Sunday night show and visiting the Facebook groups for help with an item or for you to help others with theirs. Don't forget to have fun! Seniors need fun too. Remember: no matter what your routine, or how you work your business, the key is Consistency. Should you be concerned about eBay Mobile? In a word, YES, you should be concerned about eBay Mobile! eBay Mobile is the app on smart phones and tablets from which you can buy and sell. When I was at the eBay Radio Party last month, staffers from the eBay Mobile team told us that 30% of all items purchased on eBay today are done so from a mobile device. So, what does that mean to you? Mainly it means your item descriptions should be readily available, look good and be well-organized on not only computer monitors, but small screens. As one who designs eBay stores and listing templates for many of my fellow sellers, this has been quite a challenge; I brand eBay businesses and want listings to look good on all sizes of screens. 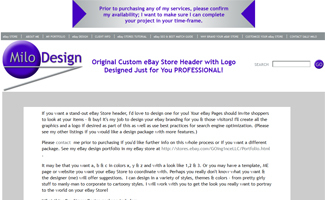 While, for years, I generally created templates which have a header at the top of the listing with the seller's logo, perhaps a slogan and links to his eBay pages. That looks good on a monitor of 15" to 36" wide, but when one views the item description on his phone, he will have to scroll down and over to get to the description text - not a good shopping experience. Some sellers have abandoned their listing templates and have only a block of plain text to enable mobile shoppers to see just the description - but that is boring and does nothing to brand the seller's business for viewing on a monitor! Some are keeping their templates they've used for years because they look professional on monitors - but mobile shoppers aren't seeing the important description they're seeking. The eBay Mobile team doesn't allow for us to use CSS so that we can dictate "look like this on a monitor and like that on a mobile device", nor do they have anything in place to strip the "fancy stuff" on those mobile listings. (I'm working on changing that as I can!) So, what to do? I've come up with a basic template design to address screens of all sizes - not perfect for the small screen and large, but a decent compromise I believe. Granted, you don't see the whole description right off the bat, but you see the description's right there and with a bit of squeezing to make the text smaller or with minimal right-scrolling, one can easily read the item description without having to see a bunch of other stuff. The mobile shopper who wants to read my description will have to scroll down a bit to see the description text - not a good experience! I don't know what number of listings in what categories sell on mobile versus on a monitor. I suspect electronics, media, sporting goods and many clothing items have a much higher sell rate on mobile than monitors - and that collectibles and jewelry do better from one's laptop or desktop computer - but that's only a guess. I tend to be one of those 80/20 people; I concern myself with the 80% more so than the 20%, but with mobile now being nearly a third of all eBay transacting, I'm finally getting on board with paying attention to that market as well as the market I've been dealing with for years. Yes, we have to be concerned with the changing marketplace on eBay as well as the whole internet! AuctionWeb to eBay in September of that year.